The legacy of Joe Paterno was of a football program that molded boys into men, and did so with success for many years. 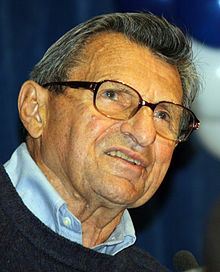 Paterno was the archetype of the term “college football coach”, and a model of the Italian American community. In that community of sports figures, his name could have easily been mentioned in the same breath as Lombardi, DiMaggio, and Marciano. Legendary in his work. How sickening it was to learn, this past week, that his legacy will have nothing to do with football – but will have everything to do with his role as a protector of a sexual predator. A predator that preyed on children, ruining their lives. It was easy to think previously that Paterno knew nothing, or knew little, about the crimes of Jerry Sandusky. That they were beyond his comprehension. But he did know. He knew for years. Lied about it. Did his part to try to cover it up. He turned his back on the innocent. All in the name of his football program and its “reputation”. He could have stopped the actions of a monster, but he turned his back instead. Could this have happened under the watch of Lombardi? In the locker room of DiMaggio? In the gym of Marciano? Before the information from the Penn State investigation came out last week, I would have said “no”. As in hell, no. But no can turn into “who knows?”. Now, you can never be sure. About anything. This is part of what Paterno’s betrayal has done. The worship of men, no matter the status, is a losing proposition. Can’t do it. It gives power and prestige to those that should never have it. Because they are human. They are flawed. Some of them are evil. How many parents do you think felt completely confident sending their boys into the Penn State football program? Answer: All of them. How could they have known that they were bringing their children to rapists, molesters, liars? If you are a parent, you are always on the offensive to begin with. When your kid drives a car. When they get into a car driven by someone else. When they go out with a friend. Parents, it’s time to get your paranoia on. If you haven’t already. Every time your kids meet a new friend, meet a friend’s family, or go out among strangers, question it. Question everything. Make them give you every bit of information their little brains have. You’re in a new world now. Where coaches protect criminals, and themselves, in the name of fame, power and money. God forbid if your child is the one in the crossfire. I admired Joe Paterno. Thought he was one of the good guys, a role model. I was fooled. I won’t get fooled again. The tradition that is the worship of men can no longer continue. Mickey Mantle is a memory, Willie Mays has faded, and “Where have you gone?” is a question that is no longer asked of Joe DiMaggio. We know where they have gone. What they’ve left behind is a world where human tragedies play out off the field in the business of sports. This story just sickens me. Paterno could have stopped this. He could have done the right thing. He wasn’t a rookie coach risking his job. He was a godlike figure. This could have been handled the right way and he just let it go to hell.